(NationalSecurity.news) While the Obama Administration’s efforts to combat the Islamic State of Iraq and Syria have been heavily condemned as too little, too late, by many defense hawks, one new development won’t ease that criticism: No sooner did U.S.-trained fighters whom the Pentagon planned to send into battle against ISIS hit the ground in Syria than they turned over all of their weapons and ammunition to members of the self-declared caliphate. 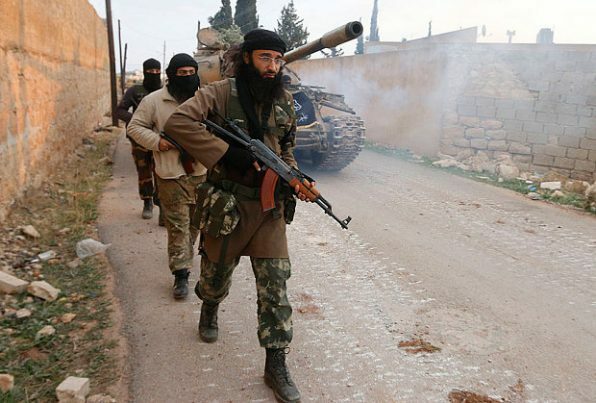 Fighters with Division 30, the so-called “moderate” rebel division in favor with the Pentagon, surrendered to members of the al-Qaeda-affiliated Jabhat al-Nusra, a number of sources said in statements to the UK’s Telegraph Sept 22. Division 30 was the first rebel faction whose members graduated from a U.S.-led training program in Turkey. The program was designed to put a force on the ground in Syria to fight against ISIS, but early indications are that the expensive effort has been ineffective if not moot. A statement on Twitter by a man calling himself Abu Fahd al-Tunisi, a member of al-Qaeda’s local affiliate Jabhat al-Nusra, said, “A strong slap for America… the new group from Division 30 that entered yesterday hands over all of its weapons to Jabhat al-Nusra after being granted safe passage. “They handed over a very large amount of ammunition and medium weaponry and a number of pick-ups,” the statement continued. Abu Khattab al-Maqdisi, who claims that he is a member of Jabhat al-Nusra, also said that Division 30’s commander, Anas Ibrahim Obaid, explained to Jabhat al-Nusra’s leaders that he tricked the American-led coalition because it was one way to get weapons. U.S. Central Command (CENTCOM) has confirmed that around 70 graduates of a Syrian “train and equip” program had re-entered the war-torn country with their weapons and gear and were operating as New Syrian Forces along side other groups battling ISIS and President Bashar al-Assad’s government forces. A week ago, U.S. Army Gen. Lloyd Austin, head of CENTCOM, shocked members in the Senate’s armed services committee when he said there were only handful of program graduates still fighting inside Syria. “We’re talking four or five,” he said. The program has also come under fire for its massive $500 million price tag at a time when the Obama Administration is trimming U.S. forces under provisions of U.S. law known as sequestration. In an interview with Defense Media Activity, the outgoing chairman of the Joint Chiefs of Staff, Army Gen. Martin Dempsey, said the world is more unsettled now than at any time during his 41-year career, and the Middle East dominates that instability. ISIL is another name for ISIS.